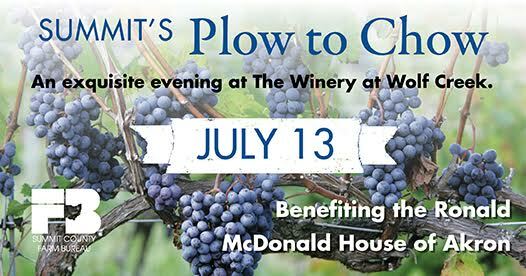 Summit County Farm Bureau and the Ronald McDonald House of Akron invite you to Summit’s Plow to Chow July 13, 2017. Enjoy an exquisite evening of wine tasting, heavy hors d’oeuvres and entertainment at The Winery at Wolf Creek. You can’t put a price on being close to your child in their time of need. By purchasing your tickets to this wonderful event, you are helping the Ronald McDonald House of Akron provide emotional and physical comfort as well as support for the families of sick children during those tough times. Tickets are $75 per person. Reservations required. Call ( 800) 654-5158.